Kodak exited many of its famous consumer facing businesses in 2012 after filing for Chapter 11 bankruptcy. The digital camera business shuttered a month after that event, then it gave up on the desktop inkjet business, before flogging off lots of valuable patents. Today we see the Kodak brand revived once more in the consumer-space and a first significant new product which also rekindles the popular photography Ektra name. The full specs and plenty of other details about the new Kodak Ektra are available on the official site. 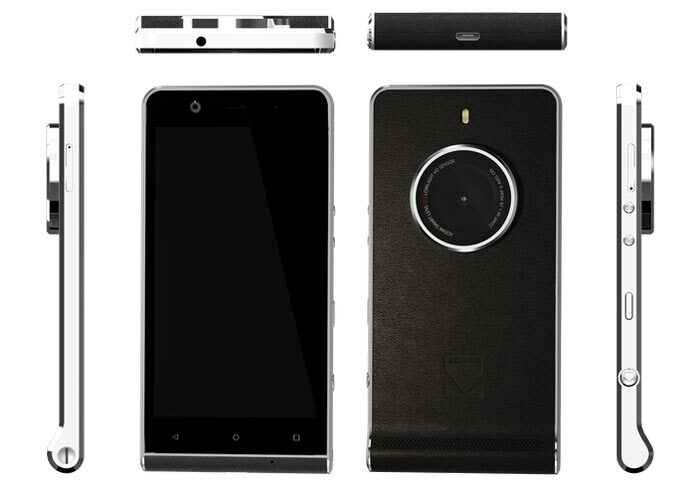 This new product is, as headlined, a camera-centric smartphone. Its base specs are; a 5-inch full HD IPS display protected by Gorilla Glass, a MediaTek Helio X-20 decacore processor, 3GB of RAM, 32GB or storage (+microSD), and a 3000mAh fast-charging battery. The device runs on Android 6.0 Marshmallow. It measures 147.8 x 73.35 x 9.69mm (with 14mm lens bump). Of course, those specs are just the supporting act to the camera functionality and the retro nostalgic styling of the Kodak Ektra. Kodak has equipped this device with a 21-megapixel Sony sensor (IMX230) and f2.0 lens on the back which is surrounded by a large steel rimmed 'lens' area. This camera bump is complemented in style abd balanced by the rounded camera grip area. The whole of the back is coated in a leather-look finish with an embossed Kodak logo. Round the front, the selifie camera is a 13MP f/2.2 lens equipped unit. In operation this camera is controlled by an "intuitive touchscreen DSLR Dial" with haptic touch feedback. The dedicated hardware shutter button offers a two-step release, there are extensive scene modes and a manual mode which is customisable. Helping you get good crisp shots is the built-in Optical Image Stabilisation (OIS), and fast focus is facilitated by Phase Detection Auto Focus (PDAF). The cameras can snap HDR images and anything from 'Super 8' vintage to modern 4K videos. 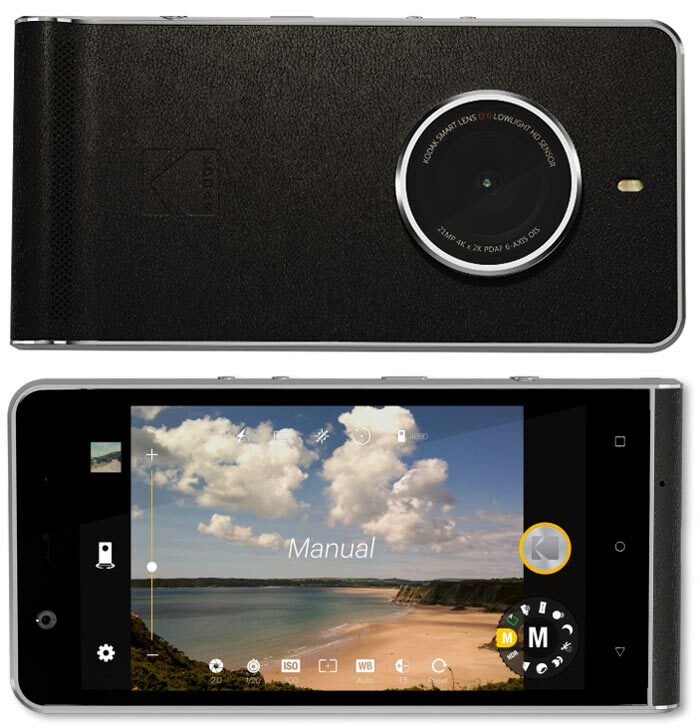 This new Kodak Ektra smartphone is produced by UK-based device firm Bullit, also the maker of mobiles for the likes of JCB and The Ministry of Sound. If you are interested in purchasing the Kodak Ektra it has an RRP of £449/€499/$550 and is set to become available in December. It's not even released and it's already out of date? I hope they revise that before launch or have a day 1 update ready. Other than that, it looks like a nice machine. We definitely need more non-flat smartphones.